In 2012, Patrick M. Lloyd, dean of the College of Dentistry, joined Ohio State’s global strategies team as well as deans and faculty from the university’s other health science colleges to travel to Addis Ababa University (AAU) and the University of Gondar in Ethiopia. With an eye toward developing mutually-beneficial partnerships with their colleagues at these universities, the team laid the foundation for The Ohio State University Health Sciences-Ethiopia One Health Partnership—a relationship that has already proven productive. 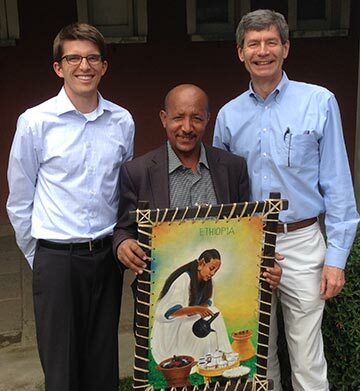 In June, Beau Meyer DDS ’14, who accompanied Dean Lloyd during last year’s visit, returned to Ethiopia with Carl Allen DDS, MSD, professor emeritus in the college’s Division of Oral and Maxillofacial Pathology, for the Summer Institute. Through his meticulous journal entries, Dr. Meyer provides a glimpse into the promising possibilities of our Ethiopian outreach efforts. Today started with a greeting from the dean of the dental school, Dr. Wondwossen, at the airport and then a tour of the dental school. The renovations to the school are progressing well, and I was pleased to see this progress, albeit slow. They will move from a six-chair clinic to a 40-chair clinic! It looks quite impressive, and gives me hope that the school will be able to thrive. We toured the adjacent hospital’s dental department today. They have two chairs in this hospital and they see two types of patients—tooth pain requiring extraction or fractured mandibles. Something like 70 patients are seen a day and 15% are fractures, according to the dentists working here. They could use some advanced surgical training in the management of mandibular fractures. I get the sense that they don’t want us to take over the clinic, but instead would prefer us to teach them how to be more skilled clinicians. I spoke with Dr. Wondwossen about future collaborations. I kept leaning towards public health initiatives or research topics. Two major sensory memories I have of today: First, it is very difficult for me to breathe normally. My respiratory rate is much faster—could some of that be due to the altitude? There are no emissions standards here, which is probably why the smog is pretty thick. Second, at AAU, we got to see the cafeteria where students can get lunch. Somebody had left sugar sitting out, and these birds were feasting on it—green and yellow finches and some pretty songbird with a vibrant orange beak. We got to the school around 9:00 a.m. today. Dr. Allen started his lectures at 10:00. Dr. Wondwossen gave us both glowing introductions before we started. Carl talked about how to do a head and neck exam, and how to identify common lesions. After lunch we went to the Black Lion Hospital where the medical school is located. The dental students rotate through here with the medical students during their basic science education. We met with Dr. Dereje Gulilat, dean of the medical school. An OB/GYN, she was very excited about having dentistry and oral health involved in this year’s summer institute. She kept saying how our profession crosscuts ages, genders, and health disciplines. We discussed studying mefakia (a natural wooden toothbrush) at medicinal level with Pharmacy and at a program or initiative level with Public Health. I spoke on oral health stages and prevention strategies used in the United States, including sealants and fluoride. I used toothbrushes as incentives to participate in my presentations. I think it went very well—the students said it was helpful. Some of the material was review for them, but most of it was new. I’ve run into several familiar faces so far, and they remember me, which is very exciting. I think that speaks to the potential strengths of the partnership. Today started off strangely. I woke up to loud music at 2:00 a.m. that lasted until 5:00 a.m. I figured it wouldn’t last that long, but then I remembered that the World Cup started last night. Carl finished the common lesion lecture today, and then started on oral manifestations of HIV. The HIV/AIDS situation in Ethiopia is improving, but dentists insisted on learning more about the oral manifestations. I spoke on dental trauma in children; its diagnosis and management. The students said they had never learned anything about tooth trauma management, so I was glad to be able to provide a brief introduction on the topic. Today was a scheduled half-day lecture, so Carl used this time to provide an intro into precancerous changes. The oral surgeon at AAU was in attendance today, and she had many questions for Carl. After the lecture, several students asked for my autograph, which was a very strange feeling. We spent our entire day at AAU’s dental school. Carl presented some of his most interesting cases in between and even through some power outages. During one of the outages, I went to see how their clinics were running. Today, a lot of new patients were being seen, and every patient required extractions, which was basically the only option available given the power outage situation. Dr. Solomon, a prosthodontist born in Ethiopia but trained in Cuba, showed me their lab and how they make dentures. Even though they don’t get a lot of denture experience, they still learn some of the basic techniques. My lectures today were on treatment considerations for the pediatric patient, public health topics related to dentistry, and three cases I completed while in dental school. All three lectures were very well received. Most of the students were in their fourth year, and they have a very solid foundation in the basic sciences. The university, along with the students we lectured to, presented us with gifts before we left. They had a very nice reception for us immediately after our lectures. Overall, this trip has been a productive visit for the College of Dentistry. The students at AAU have a passion for learning, and our faculty members have a passion for teaching. A perfect match.